Master Regal, "Earlier Today": Aleister Black IS going to show up. Make sure to send him my way before anything else happens. I'm counting on you, cannon fod... uh, four randos in black shirts. Some Guy, the Full Sailors, and Probably Even You: ADAM COLE, BAY BAY! Some Full Sailors: Bobby! Bobby! Bobby! Tha Carter III: Let me tell you an honest truth your three yes men won't... you don't deserve a shot at the North American championship. Adam Cole: Messing with us is not the smart play here. TCIII: You didn't win, but you're out here with your squad, your gusto, your bravado. If you guys are at 100%, it doesn't matter because I Am The Top 1%. Adam Cole: EC3, shut up! How about this: how about we get a referee out here and I make an example out of you? TCIII: Well, then summon a referee we shall! Cole: Basement superkick! Neckbreakers! Boot chokes! Cole: Nope! Oshigoroshi! Guillotine with bodyscissors! Full Sailors: EC3! EC3! EC3! TCIII: Flying Santana! NOW I have the avalanche! Release German! Sitout bomb! Cole: As I was saying before I was so rudely schoolboyed, Last Shot II! NXT belongs to us! Full Sailors: Mia's gonna kill you! Mia's gonna kill you! Aliyah: Hangwoman! Half straightjacket! Northern Lights! Mia: Cute. Flying kick! John Woo dropkick! Yakuza kick! Cannonball! Seoul Food! Master Regal, Obviously Wearied: I'll take it under advisement. Queen Cathy: Mr. Regal, do you know the name Nikki gave Aleister to close out last week's program? Adam Cole: You need to do your job and get your act together! A Proper Villain's Look Emerges From Our Leader: Perhaps YOU need to get YOUR act together, especially since Robert ruined our World Tag Title match last week and just laid out EC3 with an injury similar to the one he's been suffering from for so long! Next week, the War Raiders will return, and they will face Bobby Fish — pointed look — and Adam Cole. Full Sailors: Ohno! Ohno! Ohno! Ohno: This ain't what I asked for, Regal! Ohno: And I said PUMP. KICK. Senton! Another! DEATH BLOW! #14: With all due respect, "sir", wipe that smug look off your face. And boy, don't you stare at the Champ's title; make your announcement. the Dream: Hold the phones and stop the presses, the headline, or headliner, is here. the Dream: The people want an Experience. But Mr. Regal, what I want you to do is say my name. 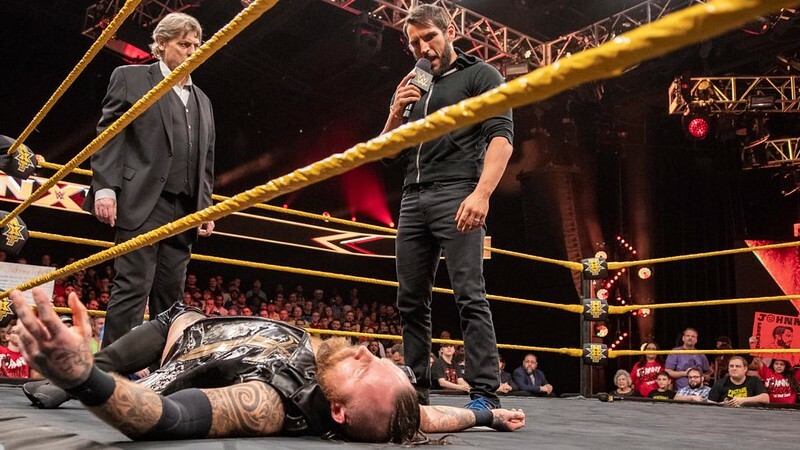 Lars Sullivan: Be mindful where you are — this isn't up for debate — where you're standing is Lars Sullivan Territory. I'm NXT's worst nightmare, and the gold belongs to me! the Dream: I understand you consider yourself a nightmare, but whence you speak to the Dream? I'm going to need you to wear some pants. Nikki: slides into the ring He's coming! He's coming! Full Sailors, Recovering From the Shock: BOOOOOOOOOOOOOOOOOOOOOOOOOOOOOOOOOOOOOOOOO!